The new revolutionary KATA DVG-53 Camcorder Guard is fabricated from a special semi-rigid closed cell foam and fabric lamination thermo pressed to duplicate the exact camcorder design, so that it will safeguard your camcorder from knocks, bumps, scratches, dust and dirt. The design matches itself to the unique shape of the Canon XLH1, XL2 while transparent windows, dedicated cable connecting slots and quick access pull flaps to buttons and controls allow easy monitoring and operating of all functions. 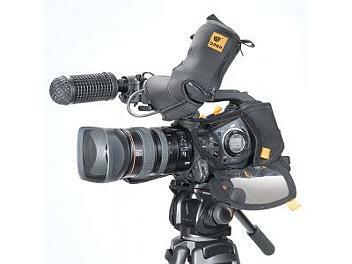 A special flexible viewfinder sleeve designed specifically for the flip-open Canon VF is included with the DVG. Once on, the DVG need never be taken off !